KENNETT — Hamorton United Methodist Church will be hosting a free organ recital on Sat., Nov. 23 at 3 p.m. to celebrate the installation and restoration of its new church organ. The recital will feature Shawn Gingrich along with Robert Carbaugh, Peter Gingrich and Sarah Gingrich. The organ, a Moller Opus 11482, built by The Moller Organ Company of Hagerstown, MD. was originally purchased by Messiah College in Grantham, in 1981. 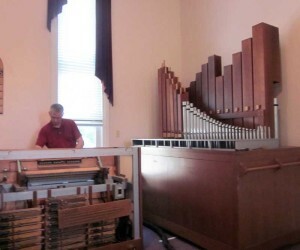 When the college built a new music building earlier this year, the instrument was no longer needed and was given to the school’s organ instructor, Dr. Shawn Gingrich. Upon hearing that Hamorton UMC were about to launch an organ fund, he in turn, generously, donated the organ to the church. With the help of church members the organ was moved into the sanctuary and over the last several months has been restored by Carbaugh and Shawn Gingrich resulting in a finely tuned organ which is now operating in top condition. The organ has six ranks of pipes, totaling 414 individual pipes playable on a console with two manuals and pedal. To celebrate the installation of this organ, Hamorton UMC invites all to join them in celebrating the music. There is no charge to attend but there will be a freewill offering taken during the concert. Hamorton United Methodist Church is located at 1052, E. Baltimore Pike, (US-1 and Route 52) Kennett Square.